An actor/model, a senator, an archer/entrepreneur, a singer/deejay/veejay and a bikini open contestant comprise nos. 81 to 85 ranking of RP's Sexiest Men of 2010. NO. 81: MARCO ALCARAZ – He is a kapuso actor/model who appeared on tv programs such as Tinik sa Dibdib and Rosalinda. His last movies were Pitik Bulag and Marino. He is the boyfriend of Miss International Precious Lara Quigaman. He ranked no. 78 in 2009, no. 76 in 2008 and no. 52 in 2007. NO. 82: MARVIN AGUSTIN – 31-year-old kapuso actor, entrepreneur and archer. He appeared in tv programs such as Tinik sa Dibdib, Panday Kids and he is also one of the hosts of Party Pilipinas. He ranked no. 75 in 2008 and he’s back in the ranking this year. NO. 83: CHRIS CAYZER – He is a Filipino-Australian soul, R&B and acoustic singer, actor, DJ and VJ. His last album was entitled “You’re the Only Thing.” From being a kapamilya to kapuso and now a kapatid, Chris is currently seen on the youth-oriented drama BFGF and musical variety show P05. He ranked no. 98 in 2008 and no. 76 in 2009. NO. 84: RAPH ALMEDA – He is a model and bikini pageant contestant. He is one of the 20 Metro Bodies of 2009 by Metro Magazine. He is a new entry in our Top 100. NO. 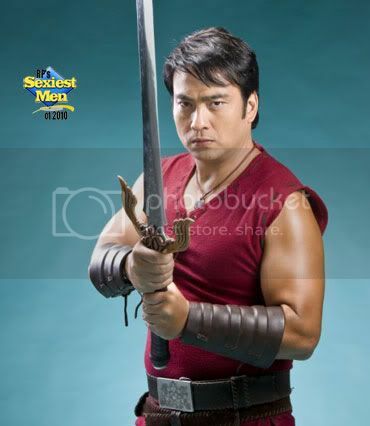 85: BONG REVILLA – He inherited Fernando Poe Jr.’s throne as the new Panday and he is currently running for re-election as Senator of the Philippine Republic. After the elections, he will resume his hosting stint on GMA’s top-rating Kap’s Amazing Stories. He ranked no. 53 in 2007. The finals of RP’s Sexiest Men 2010 are ongoing. 16 male celebrities are left vying for the title. To vote, click HERE.